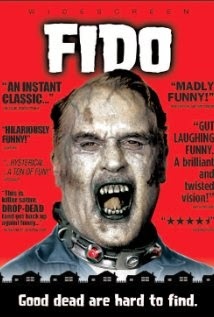 Tonight we watched Fido for #undeadOctober. It is a cute zombie about a awkward unpopular boy whose dad doesn't want him to have a pet zombie. The boy's mom, tired of standing out in the neighborhood, decides to just go out and pick one up anyway. Does the story sound a little crazy to you? Well, in the context of their world, it isn't strange at all. Their current situation was created when the Earth passed through a cloud of space dust that caused all of the dead to come back to life. The newly created zombies had a mighty hunger for human flesh and soon, the zombie war began. Eventually, the living won, but the risk of zombies was ever present since anyone who died would still come back to life. This led to the creation of a company called Zombiecon, which helped create fences around the town. They continued to make new advances in the zombie control area and eventually invented the zombie pacification collar. The collar turns any zombie into a calm and domesticated, household pet. I really like this movie and I find it to be surprisingly funny. When you first hear the plot, it might sound a little lame, but I really enjoy the fake 1950s movies. This one even has the cheesy information video for kids about what to do if zombies attack. They sing songs and learn about how you shouldn't aim for the chest because headshots are the best. I give this one a 5/5 even though it isn't the average blood and guts zombie movie. Overall, I do think this is one of my favorites and it is one that everyone should check out. Now for a quick review of the zombies. They do not appear to feel pain and they are not required to eat human flesh to survive. They also do not try to eat brains like some other zombies and instead prefer to just bite the living when possible. Wearing their collars (when they are turned on), causes the zombie to lose all aggression and they will respond to basic commands. They are still not very dexterous, however, so they are unable to perform even the most simple tasks effectively. That doesn't stop anyone from keeping them around as pets though, which turns out to be pretty funny. This was a great movie so go check it out if you are looking for a funny zombie movie. Otherwise keep checking back as we watch more and more crazy zombie movies this month.